To date, nearly half of the nation's 50 states have stop-and-identify laws. These mandate that you must identify yourself to a police officer if he or she has reasonable suspicion that a crime has been committed. Refusing to give your name may be considered resisting an officer's lawful order. 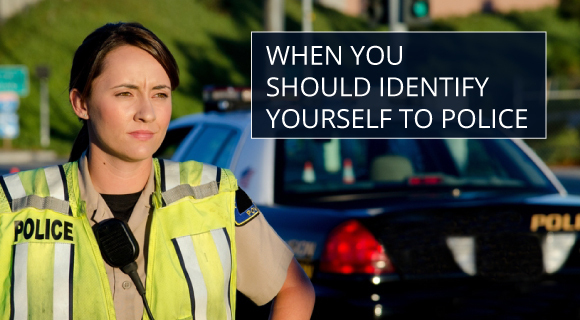 If you live in a state without a stop-and-identify law, you are not legally required to give the officer your name or present identification. You can calmly ask if you are free to go. If law enforcement responds "no," you may ask why you are being stopped. Even if your state does have such laws on the books, you still have the Fifth Amendment right to remain silent once you have identified yourself. You can let the officers know with a simple statement like "I want to remain silent." Any information you provide to a law enforcement officer can be used against you and others. In some situations, police may want to search you, your belongings or your vehicle. If you do not consent, you can respectfully state "I do not consent to a search." Even if law enforcement carries out the search, you have made your preference known. Physically resisting or running away can lead to additional charges. Keep in mind that while these are your legal rights, many experts recommend the "comply then complain" method of law enforcement interaction. If you cooperate with the police during the stop, you can file a complaint or a civil lawsuit (if necessary) later. Newer PostWhat Tests Might Occur During a DUI Stop?